SoundSwell is a new online database of local music that library cardholders can download for FREE. It also establishes an archive of local music that people can listen to for years to come. SoundSwell was created in partnership with Santa Cruz Rehearsal Studios. The database is scheduled to go live on June 3, 2014. To find the SoundSwell Local Music Collection online, visit the library home page or go directly to scmusic.santacruzpl.org. For people without internet access, there is a physical collection of CDs that can be checked out at the Downtown Branch. Anyone can find and listen to the SoundSwell streaming Local Music Collection. Library cardholders can download songs with active license agreements for free with their card number and PIN or Password. All songs in the collection currently have an active license agreement. All music in the collection is produced by Santa Cruz County musicians. This project has the potential to bring listeners and the musical community together where public dialog happens— at the library. SCPL wants to help the creators of our local culture connect with each other, connect with the community, disseminate their art, and contribute to the historical record of Santa Cruz while receiving fair compensation for their work. By helping musicians to grow their fan base locally, SoundSwell can have a positive impact on local venue attendance. Ultimately, we hope the library will play a big role in supporting the artistic musical identity of our community. We are dedicated to supporting local musicians and building a collection that celebrates the richness and talent that makes our community so unique. What a fantastic way to explore new music and discover the creative pulse of Santa Cruz. The SoundSwell project was supported in part by the Institute of Museum and Library Services under the provisions of the Library Services and Technology Act, administered in California by the State Librarian. Each artist was compensated $50 – $100 per album (depending on number of tracks) for inclusion in the collection. 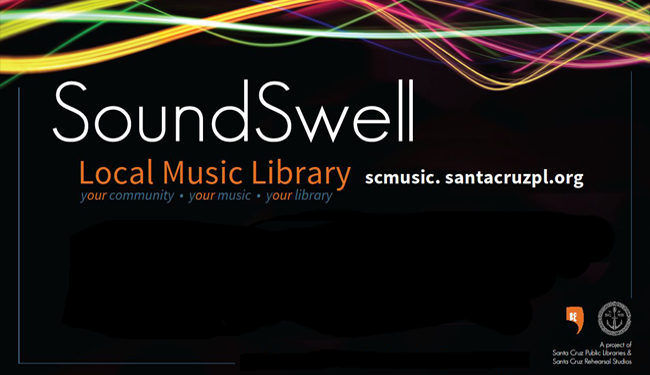 Local musicians interested in participating in SoundSwell should contact Diane Cowen, Virtual Services Librarian: by mail at Santa Cruz Public Libraries, 117 Union St. SC, 95060; by email at cowend@santacruzpl.org or by phone at 831-427-7706 x 7763.